Marvel's Luke Cage, or simply Luke Cage, is an American web television series created for Netflix by Cheo Hodari Coker, based on the Marvel Comics character of the same name. LUKE CAGE T-Shirts which we offer at Plain-t-shirts.co.uk forms part of our movie, games and music official merchandise range. 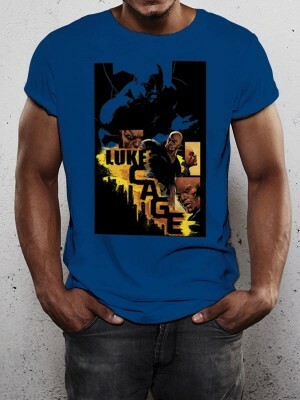 LUKE CAGE range we offer fast delivery all over UK/EU LUKE CAGE - CITY (UNISEX) which we offer which you can have as shown .. The series is produced by Marvel Television in association with ABC Studios, with Coker serving as showrunner. The series is filmed in New York City, looking to replicate the unique culture and atmosphere of Harlem. Development of the series began in late 2013. In December 2014, Colter was cast as Cage, to appear first in Marvel's Jessica Jones, with Coker hired as the showrunner in March 2015.